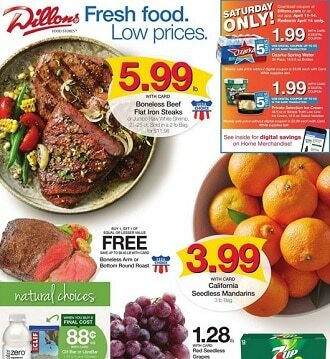 Check the latest Dillons Ad Circular, valid April 17 – April 23, 2019. Don’t miss the Dillons Sale Specials for this week, and the Free Friday download Coupon for a Free Product. Every day low prices for groceries and household staples like California Navel Oranges, Kroger Sour Cream, Jonagold Apples, Dannon Oikos Greek Yogurt, Crest Toothpaste, Mini Cinnamon Rolls, Alouette Baby Brie, Libman Angle Broom, USDA Choice Boneless Beef Chuck Roast, Johnsonville Brats or Italian Sausage, Organic Yellow Onions, Simple Truth Organic Beans, Green Mountain K-Cups Coffee, Nature’s Path Cereal. Don’t miss this week Dillons Ad deals and don’t forget to print off your coupons before heading out to shop.